This dog harness utilizes 3 adjustment points to allow for fit to girth. Sizing is given as a range of chest circumferences. 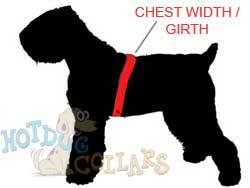 Measure your dog around the widest part of its chest, usually just behind the front legs.